The World Golf Foundation (WGF) Board of Directors announced today that Keith Dawkins, who joined The First Tee as incoming CEO last year, will be leaving the organization. Seattle, Washington will play host to the 2018 Special Olympics USA Games, the national games for Special Olympics in the United States. The 2018 LPGA Foundation scholarships are now available for application. These scholarship opportunities are available for all female junior golfers, and are not limited to LPGA-USGA Girls Golf participants. The very first executive board of the University of Washington Evans Scholars was announced on January 7, following elections that were held on the Seattle campus. SentryWorld Golf Course in Stevens Point, Wis., has been selected by the USGA as the host site for the 71st U.S. Girls’ Junior Championship. The First Tee of Greater Seattle will host a three week Winter Clinic Series for juniors ages 7-18 at five different locations across King County. Jersey City, New Jersey (September 29, 2017) – Keith Dawkins, an executive for Viacom’s Nickelodeon, will become The First Tee’s next CEO, it was announced today by the World Golf Foundation Board of Directors. The team from Southern California pulled away on Sunday to win the 49th Eddie Hogan Cup Team Matches, held Saturday and Sunday, August 12-13 at Riverside Golf & Country Club in Portland, Ore. It is with much gratitude and appreciation that we send well wishes to our fearless leader, Heidi Wills, as she completes her time as Executive Director of The First Tee of Greater Seattle. The PGA TOUR Champions and The First Tee announced today the 81 junior golfers selected to play in the 2017 PURE Insurance Championship. If you are looking to play golf in college and continue your education, the Highline College women’s golf program has scholarships available for the fall of 2017. Alvin Kwak of Mukilteo, Wash. shot 1-under 71 to claim medalist honors at U.S. Junior Amateur qualifying at Classic Golf Club in Spanaway, Wash.; while Gunnar Knutson of Mead, Wash. shot 3-over 75 to earn medalist honors at qualifying at the Club at Rock Creek in Coeur d’Alene, Idaho. Euna Han of Coquitlam, B.C. shot 1-under par 71 to earn medalist honors in qualifying to earn a spot in the 2017 U.S. Girls’ Junior Championship. The qualifier was held at Meridian Valley Country Club in Kent, Wash. The folks at WE ARE GOLF sat down with Adam Heieck, Executive Director of Youth on Course to get to know a bit more about the Youth on Course program. At the PNW PGA Girls’ Junior Championship and Boys’ Junior Championship, held June 3-4, 2017 at Canyon Lakes GC in Kennewick, Wash.
Another year of high school golf is in the books as the WIAA boys’ and girls’ state golf championships wrapped up at several courses across the state. In 2016, the First Tee of South Puget Sound was able to provide programming on the golf course, in the schools, and in the communities to 37,260 youth in Pierce, Thurston and Kitsap counties. Three participants in the state's First Tee program are getting a chance of a lifetime by being selected to compete with PGA TOUR Champions players this month. 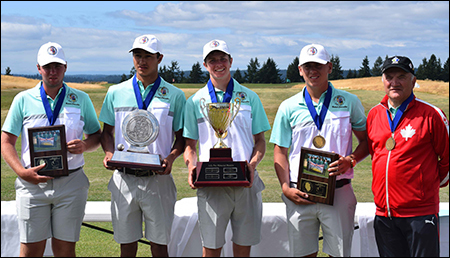 The Washington Junior Golf Association's Team Washington has captured the title at the 44th Junior America's Cup, held July 24-29 at Guadalajara Country Club in Mexico. The Hurricane Junior Golf Tour (HJGT) and Northwest Junior Golf Tour (NJrGT) have joined forces to provide junior golfers incredible playing opportunities and a chance to compete at some of the best golf venues in the area.